This week in 1R we have worked really hard on our own stories of the 3 little pigs! We used our work in Science to help us with changing the materials that the pigs used to make their houses. We had lots of great ideas, thinking about which houses would get blown down and which house could withstand the wolf huffing and puffing. Some of us even changed the ending to the story, in some cases the wolf fell into boiling water and in others the wolf got scared of the third little pig and ran off. In English we have been studying the story of the three little pigs. We began by reading the story, however we stopped along the way to explore different parts of the story. We did lots of work retelling the story orally. After we had retold the story of the 3 little pigs we thought about the following question; Should the wold have eaten the two little pigs? 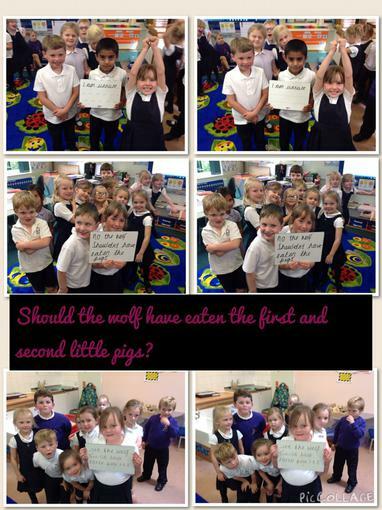 The children all had different thoughts about whether the wolf had made the right decision. We caught the big bad wolf ! The children were so excited that we had captured the Big Bad Wolf!! We had spent lots of time thinking about all the different things we would like to know if we could ask him questions. The children asked some fantastic questions which luckily the wolf managed to answer. When do you visit the vets? Why didn't you eat the third little pig? What made you want to eat the little pics? How did you manage to blow the houses down?